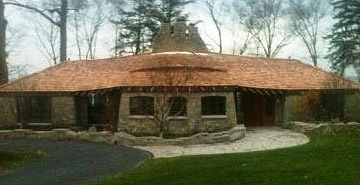 Norm’s Roofing & Siding is experienced with cedar shakes and shingles. A natural product which actually outlasts many asphalt roofs. Cedar provides the beauty and longevity that are expected on a custom built home. Installation is a more labor intensive and time consuming process than a typical asphalt roof, but the results speak for themselves. Our staff is experienced in putting together all of the details required on a cedar roof. From steaming shingles to bend over a rounded rake edge; to following the wave of a curved eave edge. We have the know how to tackle the most difficult of jobs. All valleys, ridge lines and roof cuts are typically made by using a mitre saw. This provides the most precise and accurate cutting of the cedar. Cedar is typically installed over a traditional asphalt base felt and ice and water shield. Depending on the size and type of shingles/shakes; each row may also be installed with an 18” row of felt above the head lap. 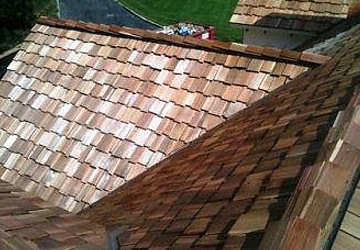 Metal valleys and flashings are typically installed in the same manner as an asphalt roof. All hips and ridge lines are ripped to a consistent width, in order to provide a uniform look.